Today, January 13, 2018, marks 26 years since my mom, Sandra, or Sandy, left this earth. There is not a day that I don’t think of her. I talk about her often, and so much so that some people do not realize she’s gone, or for how long she’s been gone. I don’t know if that is good, or “healthy,” but she is so much a part of me. This is never a great day. To the people who say that I should not be so affected after 26 years, I say that we all handle things differently. Dates are important to me. I choose to take these anniversary dates to remember my loved ones. I don’t anticipate how I will feel, I don’t punish myself, I don’t feel obligated to act any particular way. But, every year on this day, I do tend to wake up with the vivid memory of how my dad called me and said he thought my mom had died and the ambulance was on the way. His follow-up call confirmed it. 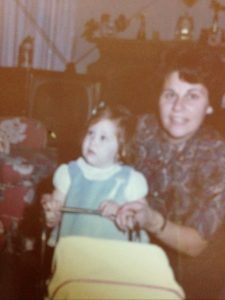 This year, again, I did wake up to those memories of the phone calls from my dad telling me that my mom died. There were tears. However, today I chose to celebrate a special memory. My mom met me in London during a summer that I spent studying there. We went to the theater every night. One of the shows we saw was Stephen Sondheim’s “Follies.” We loved it. I saw that there was a screening today of National Theater Live’s performance of this show. It seemed like a perfect way to remember my mom. The thoughts of losing and missing my mom did hover over the day. It didn’t help that I found this production particularly dark and depressing, even for Sondheim. But, I also thought of fun memories of our times together, in London and in general. Part of me can’t help but lament the time that we lost and that my mom never met Ben. But, I never lose sight of how lucky I was to have my mom. She was a truly selfless, beautiful and very adorable person and mom. In this clip, Cinderella’s father advises her that they must always cherish their home because her mom was the heart of it and they must honor her. This scene touched my heart. I cherish my memories to keep my mom’s spirit alive and honor her. 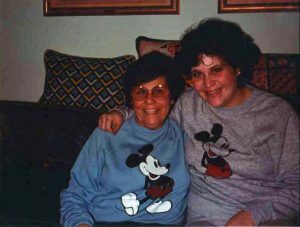 Of course, my love of Mickey Mouse and all things Disney always make me think of her, but I hope that in some small way I have followed her example. I do know that she is always with me. How could I not think about Frozen on a day like today? 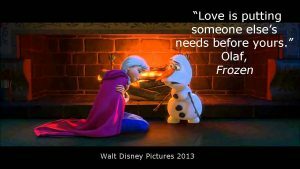 It’s a wonderful film with romance, royalty, family strife, tested loyalties, an adorable reindeer named Sven and a really cute snowman named Olaf! What’s not to love?! 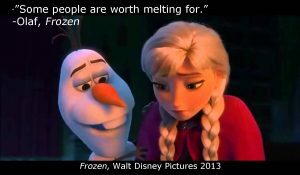 I’ve written before about what Olaf knew about love and melting (click here to read that post), but a day like today once again brings Olaf’s lessons to mind. The sweet and goofy snowman continues to sum up my caregiving experience at its core. On this freezing cold day in New York City, amidst several freezing cold days here, I could not help but reflect on days spent trying to help Ben to keep warm. 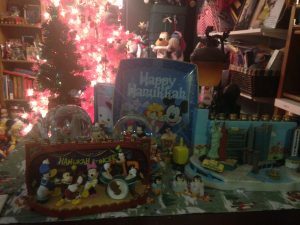 As I am writing this, I am sitting in Ben’s huge old sweat pants from Walt Disney World, along with his Mickey Mouse thermal shirt and Walt Disney World Christmas sweater. My apartment is unusually chilly- normally it feels like a sauna, so I’m happier like this. And,I like to wear Ben’s clothes. They feel cozy and like he is wrapping himself around me, and that warms my heart. Unfortunately, it was not easy to keep Ben warm. Our apartment is very drafty and Ben could not tolerate the cold. I bought big plastic insulation tarps and put them over our windows. They did help but it looked terrible and they came loose frequently, sometimes requiring middle of the night fixes. We did what we had to do. We became accustomed to living crisis to crisis in an apartment that was a disaster. 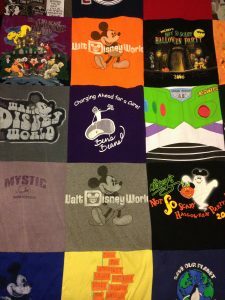 Most blankets felt heavy on Ben as his strength diminished, and piling on sweaters made movement even more difficult than it had already become due to the ALS. We found a couple of quilts that were the size of a throw, which made it easier for him to manage. We could not sleep under the same blanket because any tugging or shifting made him uncomfortable. A blanket may seem like a very minor accommodation, but it symbolized relationship changes that took an emotional toll. 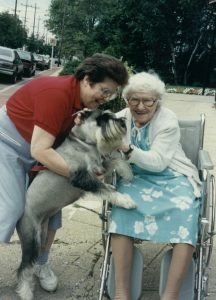 Suddenly, the life we enjoyed began to change and foretell a sad future, and the way we related to each other changed in very profound ways as we shifted from being husband and wife to patient and caregiver. It was definitely a challenge for both of us to be comfortable in the same space. I was warm or Ben was cold, but Ben needed to be warm. Physically, the apartment was a mess, with supplies accumulating, space shrinking, and furniture moving according to his needs. 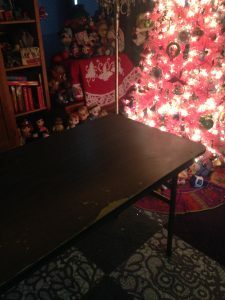 At one point, my dresser had to be moved to accommodate his chair, and it blocked the closet. For several months, I either wore what was in the drawers or whatever my hand could reach in the closet. Now, I look back and laugh at the chaos that was our life. Then, we lived crisis to crisis, and despite our frequent ability to see the hilarity in the situations, it sometimes left us feeling helpless and hopeless. Today, wearing Ben’s clothes and knowing how miserable he would be in the chill, I am feeling a little melancholy. It feels like a long time ago that these were my caregiving responsibilities, and it also feels like just yesterday. I miss him. I cannot deny the inconveniences and the emotional pain we both experienced. Ultimately, Ben’s needs unquestionably came first, and a little melting was a small price to pay. It’s taken me all this time to rebuild the snowlady that I am. I realize that I did find great satisfaction in being able to help Ben and I take pride in the love we shared and the trust he had in me. My heart is warmed to know that now he is free of the constraints of ALS. 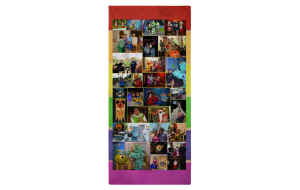 2012- Mickey’s Not So Scary Halloween Party. Ben took center stage in the scooter! My third Halloween without Ben. Though it is not traditionally a romantic holiday, for me it is, because it is the day that Ben proposed to me at Walt Disney World. 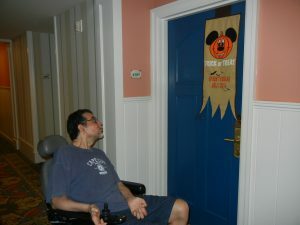 I still have not been able to decorate with our Disney Halloween decorations. As I watched the little kids going to school in their costumes, I remembered how much Ben and I loved to see the cute children at Walt Disney World. 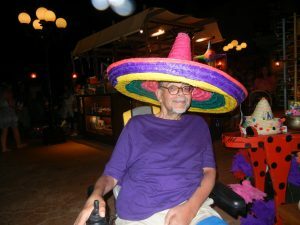 I know that if he was still here, that I would have returned home to find him watching our Walt Disney World Halloween videos, bopping his head to the music and saying “Boo to You!” as they say in the parade. We would have looked at the photos and videos together and laughed at the memories while we fantasized about a new visit. Even when the ALS was progressing, Ben constantly went on the Walt Disney World web site to plan fantasy holidays. Frankly, I think it was healthy and helpful to him to stay hopeful and engaged in life. It’s hitting me hard that although I am so grateful to have the wonderful memories, I am saddened, and feeling a little lost, that I can no longer look forward to Halloween Disney adventures with Ben. That’s a tough part of grief. As I feel like the sharp pangs lessen a bit, the day to day realities, and thoughts of an unknown future, unexpectedly set me back. One of my favorite memories, though bittersweet. 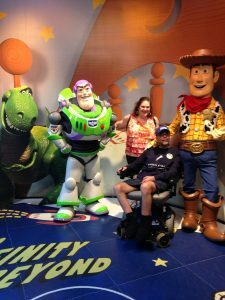 After his ALS diagnosis, Ben was reluctant to meet Buzz, because he said Buzz was a super hero and he was weak. When he did decide to greet him, Buzz made such a fuss about Ben’s Buzz shirt (his Halloween costume) and Ben loved it. It gives me comfort and joy to remember Ben’s delight. Every day my commuting routine is to listen to a special play list of special “Ben” songs. This morning, after those songs, I listened to the Walt Disney World “Hallowishes” parade music- Ben loved it even more than I did. The music did not comfort me. Although I love to picture Ben’s face watching that parade and saying “Boo to You!” I still grapple with the fact that we will never again enjoy those moments together. I wonder if I will ever want or be able to see it again. And maybe it’s okay if I never do. Maybe those were special moments that were just ours. 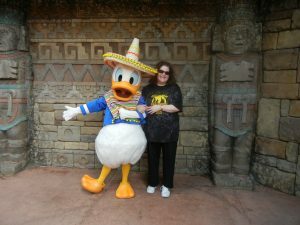 On the other hand, maybe one day I will want to return to Mickey’s Not So Scary Halloween. That will be okay, too, because Ben will always be in my heart. He will always be present, just in a different way. Unfortunately, on a day like Halloween, it is not quite enough. I need some pixie dust or some bibbidi bobbidi boo! 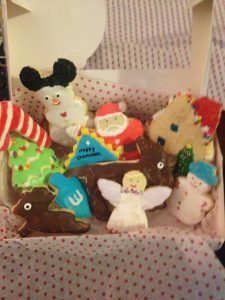 This year, I baked Halloween cookies. 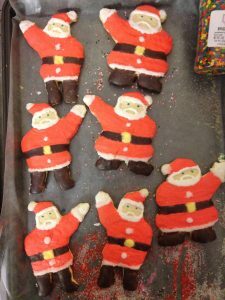 Baking and decorating cookies is almost meditative for me.I call it my therapy. It also keeps my grandma close, since she taught me my great-grandma’s recipe, and it keeps Ben close, because he is the biggest part of any Halloween tradition and he loved when I baked cookies, teasing me about my elaborate processes. On the ghosty-ghosts (what we always called ghosts) I wrote “Boo to You!” because I know Ben would have loved that, so it gave him a sweet, special presence in the holiday that is uniquely ours. I need that. 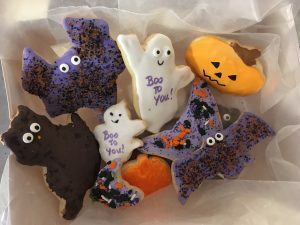 Halloween cookies honor Ben and involve him in the holiday. Now, I feel like a Halloween observer rather than a participant. Maybe it won’t always feel that way, but I do feel terribly lonely, and out of place. When it comes to Halloween, I’m only at home in the memories, so I will delve into those this evening as I look at our photos and videos. 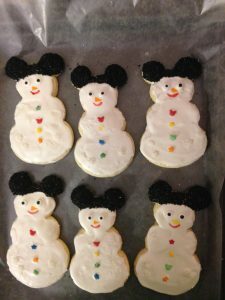 As I think about the holiday this year, and reflect on my Halloweens with Ben, I realize that my post from last year still rings as true this year, and give me a positive perspective, so here are my words and memories of our most magical Halloween ever, at Walt Disney World- IN JULY! Meeting Monsters Inc Sully and Mike. Ben LOVED Sully! Halloween was the most fun holiday for Ben and me, especially when we were at Walt Disney World for Mickey’s Not-So-Scary Halloween Party. Halloween is extra special for me because Ben proposed to me at Walt Disney World on Halloween. 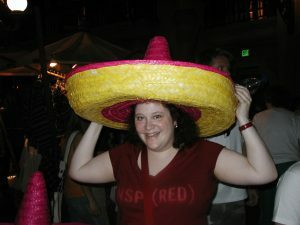 It was very exciting and, of course, I told all of my Disney buddies! Ben never tired of teasing me about my ability to talk to all of my friends. Why wouldn’t I?! 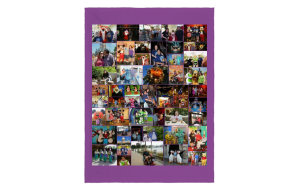 There are so many videos and photos of our amazing times, but, of all of the fun Disney times we had, I think that a most poignant memory was the Halloween celebration we had back in July 2014. That’s right, July. 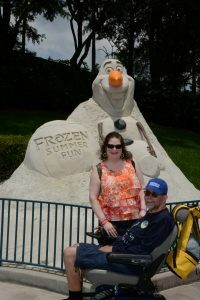 This was a very special trip, because I think that Ben and I both knew that it would likely be our last visit to Walt Disney World, as Ben’s ALS was progressing more rapidly. I wanted it to be a most incredible trip with lots of surprises. Traveling to Walt Disney World was stressful but Ben really did have an amazing attitude. 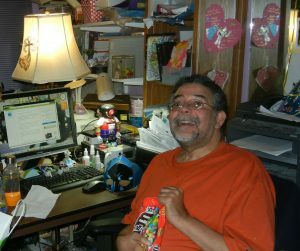 I will write some of the details to give an idea of considerations that have to be made when dealing with ALS and other disabilities. I think it was a combination of realism, naivete, determination and pixie dust that enabled me to make these plans! First, we needed to bring another caregiver. I was advised by Ben’s doctors and the ALS team that I should not do this alone. Ben wasn’t happy about it, since another person did change the dynamic, but he had to relent and I had to be strong, since I was nervous about how much assistance he required. Getting to the airport was a bit complicated, since Ben was pretty much homebound at this point. I had to hire an ambulette service to get him down the stairs and safely to the airport. I contacted JetBlue, which was great each time we flew, before and after Ben’s diagnosis. They helped me to choose seats and let me know exactly what to do when we arrived at the airport. 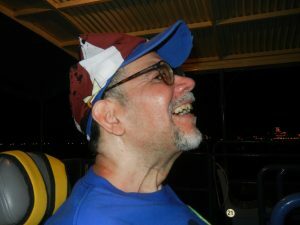 We were taken through security with relative ease and he was literally lifted and placed into his seat by a very kind and accommodating crew, one of whom revealed to me through tears that his brother had ALS. Ben was calm and in good spirits, while I was a smiling nervous wreck! 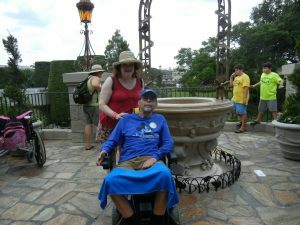 Disney’s Guest Services Department was very helpful and supportive when choosing a room, coordinating transportation to the hotel with a bus that had a wheelchair lift, and arranging for the electric wheelchair to meet us at the hotel. They even put me in touch with a local pharmacy that delivered Ben’s nutrition supplement to the hotel. It was waiting for us when we arrived! We had a room with a roll-in shower, which was such a treat for Ben. We take a lot for granted in life, don’t we? 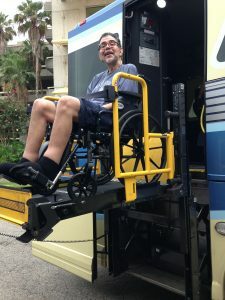 Ben even had fun on the Magic Express wheelchair lift! This was going to be a very different trip because so much about Ben’s physical abilities had changed. Ben wouldn’t be able to go on his favorite rides, Pirates of the Caribbean and the Haunted Mansion. Eating was also a big challenge. Because of these obstacles, I wanted to arrange surprises for Ben that would be fun and unusual. Ben knew I had surprises in store, but he didn’t know what I had planned. 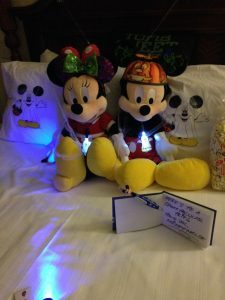 Disney has a wonderful Floral and Gift Department (click here to visit the site) that offers a variety of gift packages that can be delivered to your hotel room. They had a Halloween package but it was available during the Halloween season. I called and explained our situation, making a special request for a Halloween hotel room even though it was July. Disney is about magic and dreams come true, and they did not disappoint! When we arrived at our room, outside was a banner that said “Spooktacular Halloween July 2014!” It had a pumpkin with blinking lights. Ben thought it was a promotion for Mickey’s Halloween Party, but he still got excited. When we opened the door, the room was like a little Haunted Mansion and Ben was completely shocked, thrilled and emotional. I thought that if a full day at the parks was difficult, the room would also look very cool, and indeed, it did, but Ben did great at the parks! 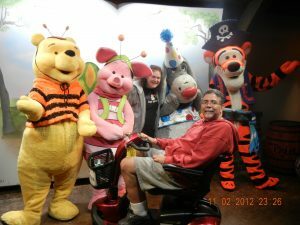 I was the one having a hard time keeping up with his zipping around in the electric wheelchair! Since we were bringing Ensure to the parks in case eating was a problem, I had also ordered from the Gift and Floral Department an insulated backpack with some goodies. 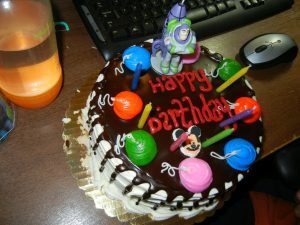 Also, we were joined by a giant walking Buzz Lightyear balloon. 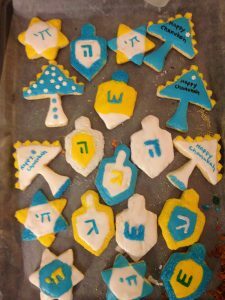 Here are pictures of some of the magic. Ben was excited just to see the banner! He had no idea what awaited him inside! Mickey Mouse and Minnie Mouse all dressed up for Halloween in July! 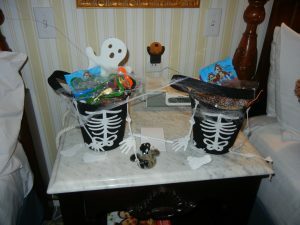 Treat baskets in our room, and a projectable haunted house that shone a haunted house on our ceiling! 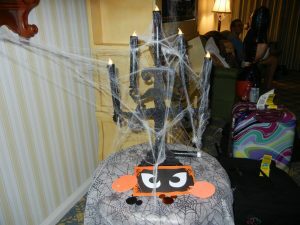 The candelabra in our haunted hotel room! Our hotel room was very fun! 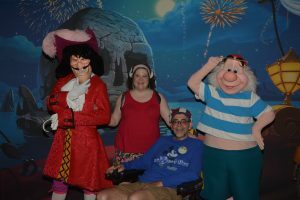 I learned that there was a Pirates and Pals Fireworks Cruise with a party where you could meet Captain Hook and Mr. Smee. When I found out that the boat was accessible, I had my next surprise for Ben! The day of the cruise, I gave him as a hint a little pirate coin I’d found at one of the gift shops. His first guess was that I’d arranged for him to go on Pirates of the Caribbean, which, sadly, I couldn’t do. We took the monorail (also accessible) to the Contemporary Hotel, where the party began. Ben laughed when he saw the really great pirate-themed decorations. We were given bandanas, too. 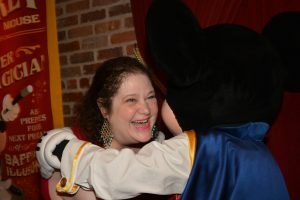 One of the truly brilliant aspects of the Disney team is that they never make someone with disabilities feel uncomfortable. A cast member came and escorted us with no fuss on an accessible path to our boat. The cruise was so much fun, the fireworks looked magnificent from the water, and, as a surprise, Peter Pan was on the dock to greet us when we returned! OK, so I was more excited than some of the children! There were tears and there was joy as we listened to the “Wishes” fireworks lyrics, but watching the delight on Ben’s face is something I will never forget. At the Pirates and Pals Fireworks Cruise Party with Captain Hook and Mr. Smee. Ben had not had a proper haircut in a few months, so I arranged for him to have a haircut and shave at the Main Street Barbershop. He was a little bit apprehensive, but, as I’ve said, he had such a great attitude, and he ended up having a great time. 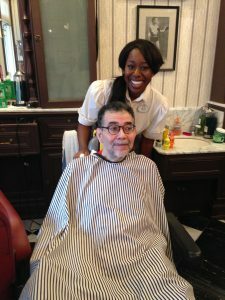 The staff accommodated his electric wheelchair and made him completely comfortable. 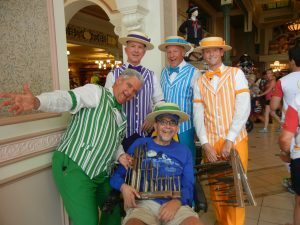 Outside of the barbershop he met up with the Dapper Dans, the singing quartet he loved. Ben got a kick out of getting his hair cut on Main Street, especially because it was decorated like an old fashioned barber shop. 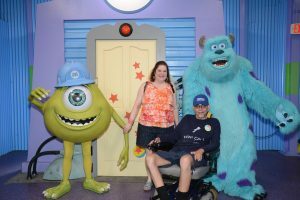 We loved our usual attractions, and Ben loved the new Little Mermaid attraction, where his wheelchair could go right into the clamshell. Of course, we were happy to see our friends. Buzz was one of Ben’s heroes, but he loved Woody and friends, too! We visited the Wishing Well at Cinderella’s Castle, which was emotional. 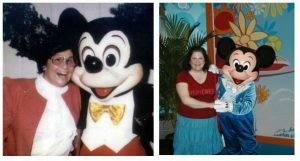 We also became overwhelmed when we met Mickey and Minnie at Epcot. Maybe it’s silly, but when dealing with something like ALS, you just want to believe in magic, or something, that will make things better. People sometimes ask me how I can believe in Disney magic, or that dreams come true. I just do, even when it’s difficult. 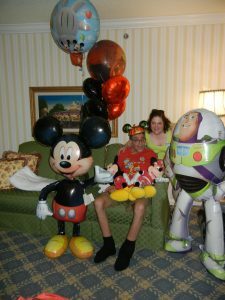 After all, Ben did okay with ALS for about 4 years, and we were fortunate to be able to travel to Walt Disney World many times, even after his diagnosis. We shared a lot of love and wonderful memories that he relived daily as he looked at our many photos and videos. We even had Halloween in July! 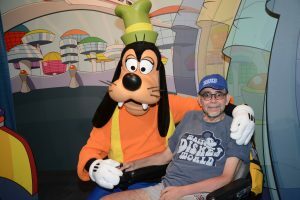 And, he left this world surrounded by music, love and even Disney. Maybe it’s a matter of perspective, but I feel the pixie dust.